I have completed my second piece for my Metamorphosis series, titled The Antagonist. (To view the first piece from this series titled The Observer, please click here.) 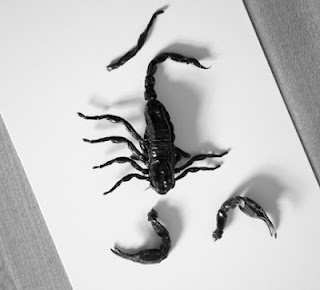 As you can see below, this is my surreal interpretation of a half male/half scorpion hybrid. I am beyond thrilled to share the very first collage I have completed for my new series titled, Metamorphosis. The image below is titled, The Observer. For the next several months I will be experimenting with merging the human form with a variety of unique looking insects ranging from butterflies, to beetles, to scorpions. 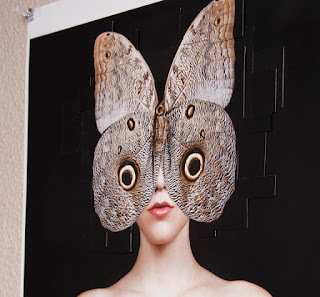 All insects used in the Metamorphosis series are taxidermy insects that I have photographed myself. No outside stock images were used or manipulated. The detail shot below may give the viewer a better visual for the use of the "tiling effect" utilized in the collage.